NASA's New Millennium Program selects breakthrough technologies that will be of the greatest use to future space and Earth science missions and that are perceived to be risky to the first user. It's one of the first issues that NASA's New Millennium Program (NMP) considers when planning a new mission. NMP has the forward-looking job to identify promising new technologies for space exploration. It then helps to mature the technology so it will be available to space missions of the future. If the technology cannot be tested adequately on Earth, the last part of this process is to actually send the technology into space. With carefully documented test results, future mission planners can confidently incorporate the new technology into their designs. “Fortunately, we have a software tool to help with this analysis,” says Linda. When it comes down to it, her job is primarily to figure out how to get the technologies into space. Her assessment is but one of a gazillion factors to be considered in planning a mission, but it is indeed one of the very first “details” that forms the foundation for the rest of the mission. Find out some of the technologies that NMP has already validated or is considering at nmp.nasa.gov/TECHNOLOGY/innovative-tech.html. Kids will enjoy watching Linda's cartoon alter-ego talk about her job at spaceplace.nasa.gov/en/kids/live . 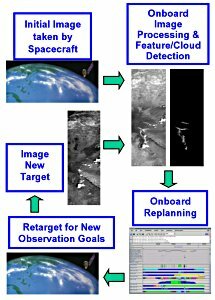 Just as changing cloud patterns on Earth were identified using Earth Observing-1's Advanced Land Imager along with ScienceCraft software, the THEMIS instrument with ScienceCraft on the Mars Odyssey spacecraft can avoid transmitting useless images. The instrument, called THEMIS (for Thermal Emission Imaging System), can "see" the heat emissions of the Martian surface in high resolution — each pixel in a THEMIS image represents only 100 meters on the ground. But THEMIS produces about five times more data than it can transmit back to Earth. Finding lava is considered a long shot, but since THEMIS is on all the time, "it makes sense to look," Chien says. Or better yet, have ScienceCraft look for you — it’s the intelligent thing to do. To learn more about the Autonomous ScienceCraft software and see an animation of how it works, visit http://ase.jpl.nasa.gov. In this case, however, the challenge was to capture snapshots of short-lived events — like missile launches! The team of JPL scientists designed the new spectrometer, called a computed tomographic imaging spectrometer (CTIS), in collaboration with the Ballistic Missile Defense Organization as a way to detect missiles by the spectral signatures of their exhaust. Blood flowing through the retina has a different spectral signature when it is rich in oxygen than when it is oxygen deprived. 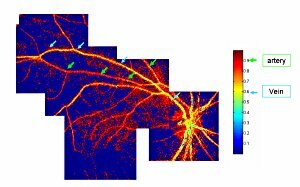 So eye doctors can use a spectrometer to look for low oxygen in the retina — an indicator of disease. However, because the eye is constantly moving, images produced by conventional spectrometers would have motion blurring that is difficult to correct. CTIS is even relatively cheap to build, consisting of standard camera lenses and a custom, etched, transparent sheet called a grating. “With the exception of the grating, we bought everything on Amazon,“ he says. The grating was custom-designed at JPL. It has a pattern of microscopic steps on its surface that split incoming light into 25 separate images arranged in a 5 by 5 grid. The center image in the grid shows the scene undistorted, but colors in the surrounding images are slightly “smeared” apart, as if the light had passed through a prism. This separation of colors reveals the light's spectrum for each pixel in the image. ”We're conducting clinical trials now,” says Bearman. If all goes well, anti-missile technology may soon be catching eye problems before they have a chance to get off the ground. Information about other NASA-developed technologies with spin-off applications can be found at http://www.sti.nasa.gov/tto . 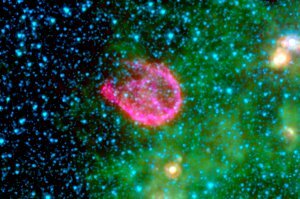 Using the IR spectrometer on the Spitzer Space Telescope, scientists found organic molecules in supernova remnant N132D. Cockroaches are supposed to be tough, able to survive anything from a good stomping to a nuclear blast. But roaches are wimps compared to a little molecule that has recently caught the eye of biologists and astronomers — the polycyclic aromatic hydrocarbon. Polycyclic aromatic hydrocarbons (PAHs for short) are ring-shaped molecules made of carbon and hydrogen. “They're all around us,” says Achim Tappe of the Harvard Center for Astrophysics. “PAHs are present in mineral oils, coal, tar, tobacco smoke and automobile exhaust.” Aromatic, ring-shaped molecules structurally akin to PAHs are found in DNA itself! The story begins a few thousand years ago when a massive star in the Large Magellanic Cloud exploded, blasting nearby star systems and interstellar clouds with hot gas and deadly radiation. The expanding shell, still visible from Earth after all these years and catalogued by astronomers as “N132D,” spans 80 light years and has swept up some 600 Suns worth of mass. Astronomers have long known that PAHs are abundant not only on Earth but throughout the cosmos — they've been found in comet dust, meteorites and many cold interstellar clouds—but who knew they were so tough? “This is our first evidence that PAHs can withstand a supernova blast,” he says. Their ability to survive may be key to life on Earth. Many astronomers are convinced that a supernova exploded in our corner of the galaxy 4-to-5 billion years ago just as the solar system was coalescing from primitive interstellar gas. In one scenario of life's origins, PAHs survived and made their way to our planet. It turns out that stacks of PAHs can form in water — think primordial seas — and provide a scaffold for nucleic acids with architectural properties akin to RNA and DNA. PAHs may be just tough enough for genesis. Find out about other Spitzer discoveries at www.spitzer.caltech.edu. Now is an exciting time for space enthusiasts. In the history of the Space Age, there have never been so many missions “out there” at once. NASA has, for example, robots on Mars, satellites orbiting Mars, a spacecraft circling Saturn, probes en route to Pluto and Mercury — and four spacecraft, the two Voyagers and the two Pioneers, are exiting the solar system altogether. It's wonderful, but it is also creating a challenge. The Deep Space Network that NASA uses to communicate with distant probes is becoming overtaxed. Status reports and data transmissions are coming in from all over the solar system — and there's only so much time to listen. Expanding the network would be expensive, so it would be nice if these probes could learn to communicate with greater brevity. But how? The system leverages the fact that for most of a probe's long voyage to a distant planet or asteroid or comet, it's not doing very much. There's little to report. During that time, mission scientists usually only need to know whether the spacecraft is in good health. 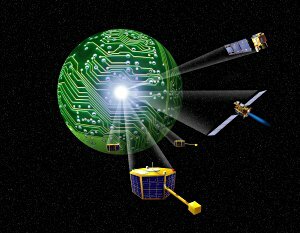 “These simple tones are much easier to detect from Earth than complex data streams, so the mission needs far less of the network's valuable time and bandwidth,” says Hotz. 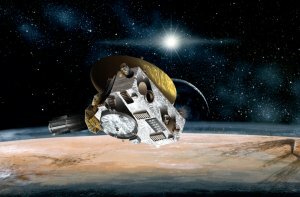 After being tested on Deep Space 1, Beacon Monitor was approved for the New Horizons mission, currently on its way to Pluto, beaming back a simple beacon as it goes. Discover more about Beacon Monitor technology, as well as other technologies, on the NMP Technology Validation Reports page, http://nmp-techval-reports.jpl.nasa.gov. 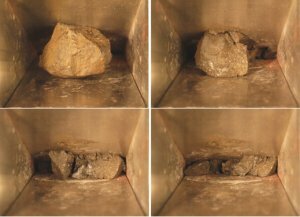 Thanks to NASA's Planetary Instrument Definition and Development Program, a small group of NASA engineers came up with the Mars Rock Crusher. Only six inches tall, it can chew the hardest rocks into a powder. 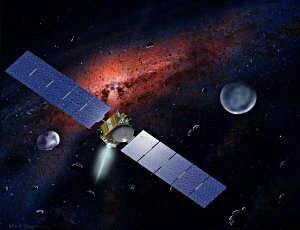 Artist's rendering of Dawn spacecraft, with asteroids. Largest are Vesta and Ceres. Credits: Dawn Spacecraft — Orbital Sciences Corporation; Background Art — William K. Hartmann, Courtesy UCLA. This summer, NASA will launch a probe bound for two unexplored worlds in our solar system's asteroid belt — giant asteroids Ceres and Vesta. The probe, called Dawn, will orbit first one body and then the other in a never-before-attempted maneuver. It has never been attempted, in part, because this mission would be virtually impossible with conventional propulsion. “Even if we were just going to go to Vesta, we would need one of the largest rockets that the U.S. has to carry all that propellant,” says Marc Rayman, Project System Engineer for Dawn at JPL. Traveling to both worlds in one mission would require an even bigger rocket. This is a trip that calls for the unconventional. “We're using ion propulsion,” says Rayman. The ion engines for the Dawn spacecraft proved themselves aboard an earlier, experimental mission known as Deep Space 1 (DS1). Because ion propulsion is a relatively new technology that's very different from conventional rockets, it was a perfect candidate for DS1, a part of NASA's New Millennium Program, which flight-tests new technologies so that missions such as Dawn can use those technologies reliably. “The fact that those same engines are now making the Dawn mission possible shows that New Millennium accomplished what it set out to,” Rayman says. Ion engines work on a principle different from conventional rockets. A normal rocket engine burns a chemical fuel to produce thrust. An ion engine doesn't burn anything; a strong electric field in the engine propels charged atoms such as xenon to very high speed. The thrust produced is tiny — roughly equivalent to the weight of a piece of paper — but over time, it can generate as much speed as a conventional rocket while using only about 1/10 as much propellant. A CloudSat ground track appears as a red line overlaid upon a GMS-6 (a Japanese weather satellite) infrared image. CloudSat is crossing the north-central Pacific Ocean on a descending orbit (from upper-right to lower-left) near a storm front. The radar data corresponding to this ground track (beginning in the center panel and continuing into the lower panel) shows a vertical cloud profile far more complex than the two-dimensional GMS-6 imagery would suggest. Thicker clouds and larger droplets are shown in yellow/red tones, while thinner clouds are shown in blue. During the summer and fall of 2006, U.S. Coast Guard planes flew over the North Pacific in search of illegal, unlicensed, and unregulated fishing boats. It was a tricky operation — in part because low clouds often block the pilots' view of anything floating on the ocean surface below. Actually, it was a satellite — CloudSat, an experimental NASA mission to study Earth's clouds in an entirely new way. While ordinary weather satellites see only the tops of clouds, CloudSat's radar penetrates clouds from top to bottom, measuring their vertical structure and extent. By tapping into CloudSat data processed at the Naval Research Laboratory (NRL) in Monterey, CA, Coast Guard pilots were better able to contend with low-lying clouds that might have otherwise hindered their search for illegal fishing activity. In the past, Coast Guard pilots would fly out over the ocean not knowing what visibility to expect. Now they can find out quickly. Data from research satellites usually takes days to weeks to process into a usable form, but NASA makes CloudSat's data publicly available on its QuickLook website and to users such as NRL in only a matter of hours — making the data useful for practical applications. “Before CloudSat, there was no way to measure cloud base from space worldwide,” says Deborah Vane, project manager for CloudSat at NASA's Jet Propulsion Laboratory. CloudSat's primary purpose is to better understand the critical role that clouds play in Earth's climate. But knowledge about the structure of clouds is useful not only for scientific research, but also to operational users such as Coast Guard patrol aircraft and Navy and commercial ships at sea. 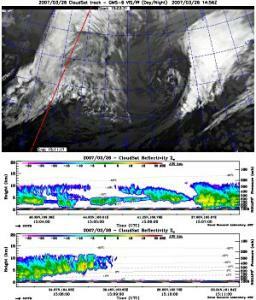 There is an archive of all data collected since the start of the mission in May 2006 on the CloudSat QuickLook website at cloudsat.atmos.colostate.edu. And to introduce kids to the fun of observing the clouds, go to spaceplace.nasa.gov/en/kids/cloudsat_puz.shtml. 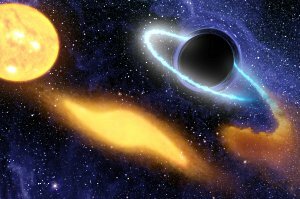 In this artist's concept, a giant black hole is caught devouring a star that ventured too close. We all know that birds eat worms. Every day, millions of birds eat millions of worms. It's going on all around you! But how often have you awakened in the morning, stalked out in the dewy grass, and actually seen a bird having breakfast? Even though we know it happens all the time, a bird gulping a worm is a rare sight. Every day in the Universe, millions of stars fall into millions of black holes. And that's bad news for the stars. Black holes exert terrible tides, and stars that come too close are literally ripped apart as they fall into the gullet of the monster. A long burp of X-rays and ultraviolet radiation signals the meal for all to see. SAILMAST is the thin triangular truss in front of the picture. 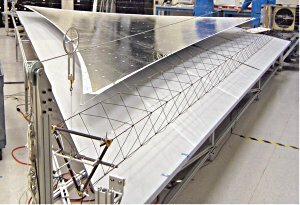 It is attached to a section of a silver foil solar sail section shown here in a laboratory test. The mast in the picture is 2m (6 ft) long. The Space Technology 8 mission will test the SAILMAST, which is 20 times longer. Solar sails, as they're called, hold great promise for providing propulsion in space without the need for heavy propellant. But building a solar sail will be hard; to make the most of sunlight's tiny push, the sail must be as large as several football fields, yet weigh next to nothing. Creating a super-lightweight material for the sail itself is tricky enough, but how do you build a “mast”” for that sail that's equally light and strong? In spite of its light weight, this truss is surprisingly rigid. “It's a revelation when people come in and actually play with one of the demo versions—it’s like, whoa, this is really strong!” says Michael McEachen, principal investigator for SAILMAST at ATK Space Systems in Goleta, California.